It could have gone better, but it could have gone much worse. 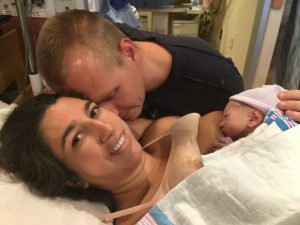 I was so looking forward to my birthing time, to being at home with my husband and doula, but when my blood pressure started really spiking at 41 weeks, my midwife recommended I be admitted to the hospital as soon as possible for an induction. I wasn’t afraid of natural childbirth, but I was afraid of Pitocin, so this was frightening news for me. I started with Cervadil overnight, then did a Foley bulb the next afternoon (per my request), neither of which started real pressure waves, although at least the Foley bulb dilated me to 4 cm. I started Pitocin at about 11 pm that night and my midwife warned me that hardly anyone has a Pitocin-induced birth without an epidural, and I knew all too well how easy it is to end up with a Cesarean once interventions come into play. But even with all the monitors and the IV drip, I could still use a birthing tub, and I had my Hypnobabies training, so I figured I would at least try and go without the epidural. That Pitocin came on like a train, and it was so intense I didn’t think I could do it, but I just kept focusing, one pressure wave at a time, with the support of my husband and doula. The pressure waves came on so strong, and so suddenly, that I couldn’t really get into hypnosis with the Easy First Stage track, but instead I just played the Birthing Day Affirmations track over and over and focused on my Peace cue until it came time to push. Seven hours after I felt my first pressure wave I held my baby boy in my arms – no epidural, no c-section! It may not have been an ideal Hypnobabies birth, certainly not the birth I imagined, but I did it as naturally as I could, against all odds. I credit the fact that I could still walk and change positions, and be upright during pressure waves that my birthing time was fast and productive. I hope to get another chance at a truly natural, intervention free Hypnobabies birth.